Beetroot with Yogurt & Walnuts – Dig Delve – An online magazine about gardens, landscape, growing & making. In two weeks we are off to Greece on holiday. The island we have been going to for the past few years is small and secluded with only a passing tourist trade, so the few restaurants are used mainly by locals, or holidaying Athenians and Greek expatriots from America and Australia. Alongside the ubiquitous Greek salad there are a number of traditional vegetable dishes served by all the establishments and one of our favourites is the inspiration for this recipe. The first time we ordered this a large plate of simply dressed beetroot came to the table, piled on top of the wilted leaves and covered in rich garlicky Greek yogurt. It was so simple, and so delicious, we couldn’t believe that we had never thought to eat beetroot greens before. They had always ended up on the compost. We get through a lot of chard and spinach and we now often eat the beetroot leaves alone like these two crops, wilted in olive oil with garlic and dressed with lemon juice. 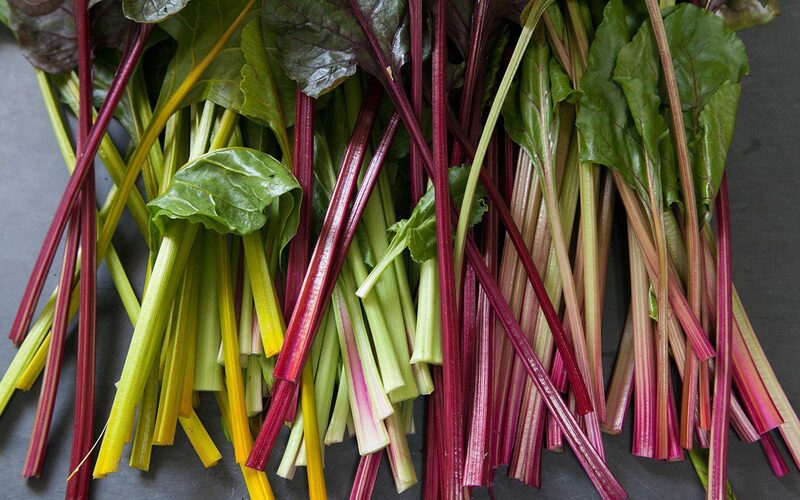 They have the earthy flavour of beets, and the stalks have something of the succulence of chard, but with a distinctive sweetness. It is important to use the leaves of young beetroot and discard the oldest leaves as the stalks of these are stringy. 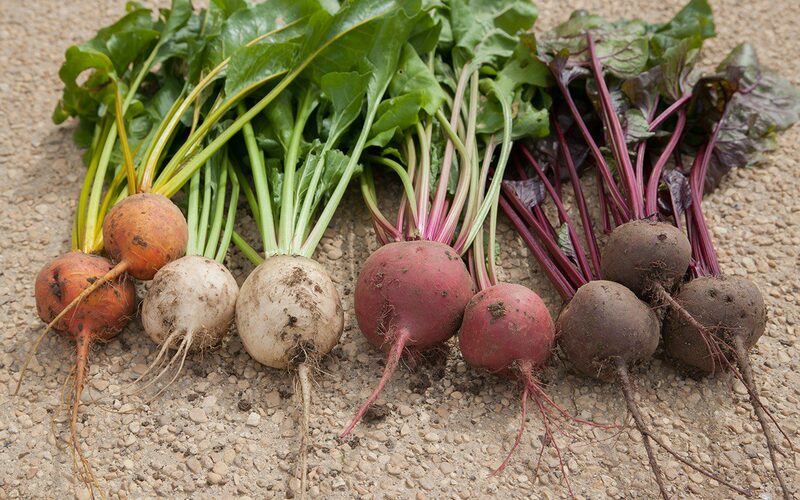 For variety we grow a number of different coloured beets and the appearance of this dish is lifted by the mix of colours. However, it is just as good with plain purple beets. 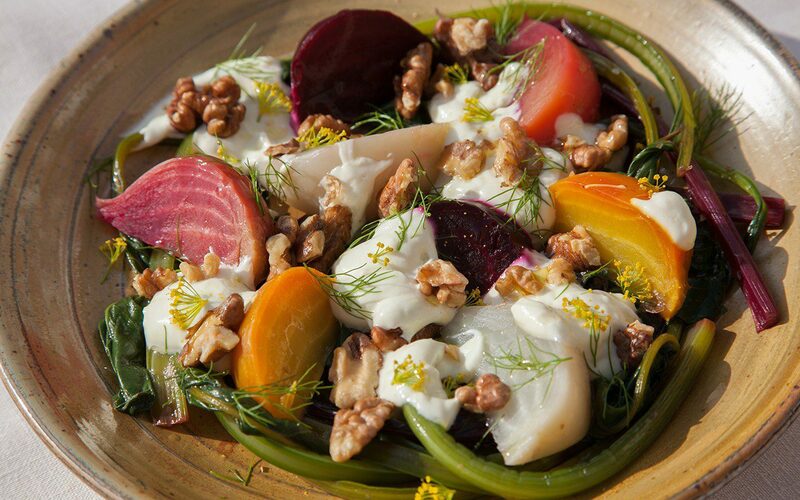 Walnuts and dill are natural companions to beetroot. The earthiness of the nuts complements that of roots and the dill adds a fresh, sweet note that prevents the dish from feeling too heavy. Fennel, parsley or mint could be used instead. Given the limited number of ingredients this dish is surprisingly rich and a little goes a long way. It can be served as part of a table of meze, with hummus, fried halloumi, meatballs and spanakopita, or as a side dish to accompany grilled white fish or chicken. 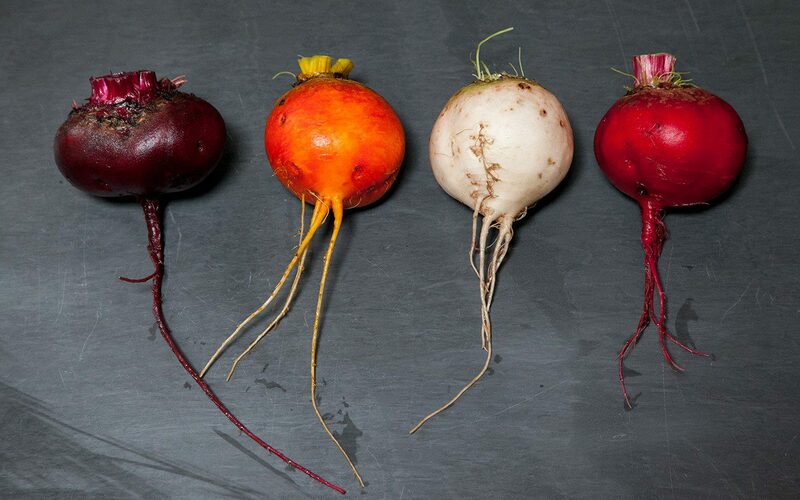 Remove the leaves from the beetroot and discard the oldest ones. Scrub the beetroots well and wrap individually in tin foil. Put into a baking tin and, depending on their size, cook for 40 – 60 minutes until you can pierce them easily with a sharp knife. Remove from the oven and allow the beetroot to cool for 20 minutes in their foil jackets. Before turning off the oven spread the walnut pieces out on a baking sheet and toast in the oven for about 3 minutes until lightly coloured and fragrant. Remove the foil from the beetroot and rub the skins off under a cold running tap or in a bowl of cold water. Slice from top to bottom into eighths to produce slim wedges. Put into a bowl and dress with lemon juice, olive oil and a little salt. If using mixed colours of beetroot you will need to use separate bowls for each variety to prevent the colours from bleeding into each other. Put a large lidded pan on a high heat. Wash the reserved beetroot leaves and immediately put into the pan with as much water as possible still clinging to them. Put the lid on tight. From time to time shake the pan and check to see that there is enough water in the pan to create steam. You may need to add an egg-cupful of water if looks like it is getting dry. They are done when you can pierce the stalks with a sharp knife. Remove from the heat, take the lid off the pan and immediately dress the leaves with lemon juice and olive oil until well coated. Season with salt and allow to cool. To make the yogurt dressing grate the garlic cloves into a bowl large enough to hold the yogurt. Add the yogurt, salt and 4 tablespoons of olive oil. Stir vigorously until well combined. To serve arrange the wilted leaves on a plate, place the beetroot wedges on top, then spoon on the yogurt dressing and scatter over the walnuts. Decorate with dill leaves and flowers and a final drizzle of olive oil.